The name Bordeaux has always evoked impressions of quiet sensual pleasure, where the civilised and the natural coexist in easy harmony, and wine-lovers are free to engage in their favourite pastime – savouring the world’s finest wines. In fact, the reality of Bordeaux is not that different from the romantic impression most people have of it. Extraordinary landscapes, delicious fare prepared with French finesse, wine-making that has been refined to an art, and a wealth of historical riches, from elegant châteaux to churches that have been around for longer than most of the new world. Celebrate the history of wine during a special Scenic Sundowners event at the spectacular Château de la Rivière and cycle through the rolling vineyards of the Sauternes region to try the Grand Cru Class wine of Château de Myrat. Explore the Cognac region to sample its famous brandy, or try fresh oysters from the waters of Arcachon Bay. You’ll find that beautiful Bordeaux is everything you imagined it to be, and more. Award-winning travel and editorial photographer Susan Seubert has photographed more than 30 feature stories for National Geographic Traveler. Her subjects range from Canada to the Caribbean and from Europe to Asia and beyond. A Francophile by nature, Susan has been captivated by French culture since she was a child. She started studying the French language when she was five years old and took her first trip to France when she was 12. Susan’s work has been recognized by Columbia University's Alfred Eisenstadt Award and most recently by the North American Travel Journalists Association for excellence in photography. She lectures regularly about her work at such institutions as Harvard University and the Portland Art Museum. Based in Portland, Oregon and Maui, Hawaii, Susan travels throughout the world shooting a variety of subjects and capturing a sense of place through her wide-ranging imagery. She has worked in France for National Geographic Traveler magazine and joined numerous National Geographic Expeditions over the years, from Alaska to Antarctica. Susan's in-depth knowledge of digital technologies and her multimedia skills keep her at the cutting edge of visual storytelling. Award-winning travel writer and speaker Don George is an Editor at Large for National Geographic Traveler and a popular expert for National Geographic Expeditions. A fervent Francophile, Don has written for Traveler about how living in France after college changed his life; he has also penned articles about cuisine in Nice, art in Paris, and tracing Joan of Arc’s route in Champagne. Over four decades as a travel writer and editor, Don has traveled throughout France, but he is especially passionate about Bordeaux for its wine, cuisine, culture, and history. Don is the author of How to Be a Travel Writer and The Way of Wanderlust: The Best Travel Writing of Don George. Award-winning travel writer and speaker Don George is an Editor at Large for National Geographic Traveler and a popular expert for National Geographic Expeditions. Over four decades as a travel writer and editor, he has traveled throughout France, especially passionate about Bordeaux for its wine, cuisine, culture, and history. Arrive in Bordeaux, a thriving port town since the Roman era and the capital of France’s most prestigious wine region. Settle into your suite aboard the Scenic Diamond and enjoy dinner on board this evening. Cruise the Garonne and Dordogne Rivers to the 13th-century port town of Libourne, and perhaps enjoy a cooking class in Scenic Culinaire along the way. Spend the afternoon in picturesque Saint-Émilion, an ancient village of cobbled alleyways and half-timbered houses set above rolling vineyards. Take a tour of the village’s Monolithic Church and catacombs, which were carved out of a limestone hill in the 12th century. End the day at the glorious Château Siaurac, where we’ll toast the sunset with the estate’s excellent wines. Choose from the following excursions today: visit the Château Franc Mayne to taste its grand cru classé, or journey to the historic city of Bergerac and sample foie gras at a nearby farm. Alternatively, head out of the city by bike, pedaling past vineyards and stopping at historic wine estates along the way. We will visit a chateaux owned by relatives of National Geographic Explorer Jacques Cousteau, who was born in this region. Cruise to Pauillac in the afternoon. Travel the scenic Médoc wine route today, gaining insights from our expert and capturing images alongside our National Geographic photographer. Opt to explore the region on foot, walking from one historic wine estate to the next and sampling local vintages along the way. 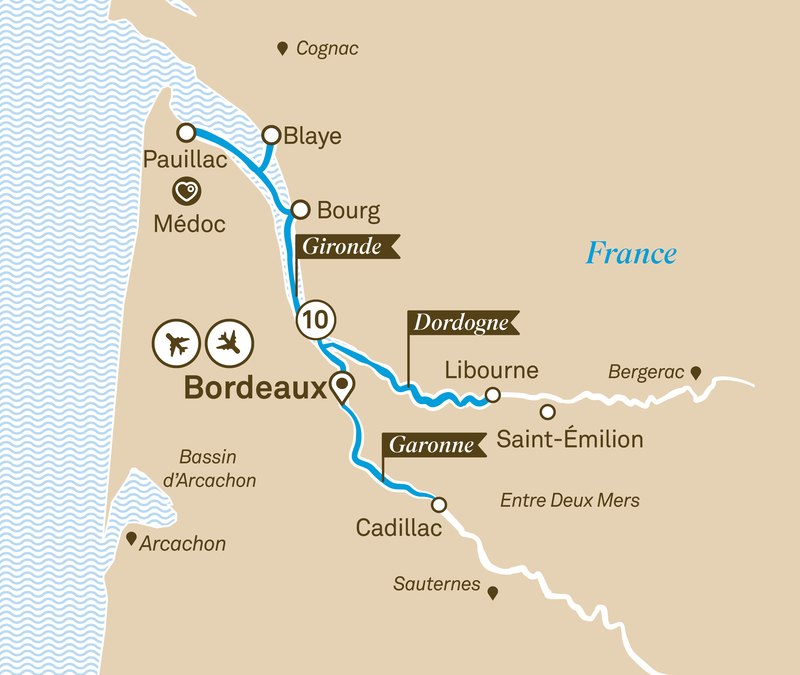 Or cycle to Château Lagrange, featured on Napoleon III’s Official Classification of Bordeaux wines in 1855. This evening, enjoy a classic musical performance at the medieval Château d’Agassac. Glide south along the Garonne, soaking in beautiful vistas of the Bordeaux region on the way to Cadillac, a port town whose fortifications date back to the Hundred Years’ War. Take part in a cooking class on board in Scenic Culinaire if you wish. In the evening, local entertainers perform on the ship. Spend the morning discovering the Sauternes region, known for its dessert wines. Cycle through rolling vineyards to Château de Myrat for a tasting of grand cru classé wines, or visit the Château Guiraud to try its prestigious vintages. Enjoy a master class in French cuisine in Scenic Culinaire, set off on a hike to the village of Loupiac. Alternatively, visit the historic Château de Roquetaillade with the family that has owned it for centuries, or visit a truffle farm and sample the delicious regional delicacy. Immerse yourself in the vibrant rhythms of Bordeaux today. Join a chef at the market to select produce, and then cook it up during a culinary class on board in Scenic Culinaire. Or take a guided tour—by vehicle or by bicycle—of the city’s bridges, gardens, and historic sites. Then join a local historian for a private visit to the Musée d’Aquitaine, which traces the tumultuous history of this region from prehistoric times to the modern era. After a dinner of regional delicacies, set out on an evening cruise to see the city lit up at night and attend a performance by a classical musician. Enjoy a day on the Arcachon Bay, edged by nature reserves and long sandy beaches. Go on a bird-watching hike with a local conservationist in the Teich Bird Reserve, where more than 300 species have been observed. Alternatively, stroll through the town of Arcachon and its outdoor market, head to the beach to climb the highest sand dune in Europe, or stay in Bordeaux and take the tram to the new Cité du Vin museum. Dock in picturesque Bourg for the night. Start the day with a tour of the Château de la Citadelle in Bourg, including its carriages museum and guardrooms. Then visit the Grotte de Pair-non-Pair with a site researcher on an excursion specially arranged by National Geographic. Discovered in 1881, the cave yielded many thousands of tools and fossils, as well as wall paintings—an incredible glimpse into life on Earth some 60,000 years ago. Alternatively, enjoy an excursion to Cognac, a fortified town renowned for its brandy, and stop for a tasting at the Rémy Martin property. Relax on the sun deck as we sail into the historic port of Blaye this evening. Take in sweeping views of vineyard-striped hills from the historic Blaye citadel on a tour of the town. Or enjoy a morning of cycling on the Captain’s Road, named after World War I captains who purchased homes along the waterway. Join a final cooking class in Scenic Culinaire or just relax on board as we make our way back to Bordeaux. Gather for a Captain’s farewell dinner tonight. Disembark after breakfast and transfer to the airport or train station in Bordeaux for your journey home. Cycle through the vineyards near Libourne, stopping at the Château Belles-Graves, owned by relatives of Jacques Cousteau, who grew up in the region and spent time at the castle. Follow a historian on a guided tour of the Musée d’Aquitaine, home to treasures from prehistory to the 20th century.